Saga kindly tagged me for a screenshot-sharing meme today, and I shall oblige, though in my own way. I find the very premise of taking the sixth image out of my sixth screenshot folder vaguely amusing, because how many screenshot folders do people have? I only have one, with three sub-folders in it called Desktops, Games and Webcam. I'm not sure why I ever thought that it was a good idea to take screenshots of my desktop, I haven't actually done anything with that folder in years. Anyway, in Games... the sixth folder in there is called Grim Fandango, and it only has four pictures in it. Let's stick to WoW I guess. I take care to sort, resize and rename my freshly taken WoW screenshots at regular intervals, but I still have over a thousand of them crammed into a single folder. Unfortunately Windows 7 doesn't let you save sorting preferences for individual folders, so every time I change sorting method while looking at anything on my PC, all my WoW screenshots get shuffled around as well, so I'm not entirely sure which one should really be the sixth. Let's make it six sixth screenshots, depending on how you sort them! If we start alphabetically, the sixth screenshot is this one simply called "A warlock and his pet". 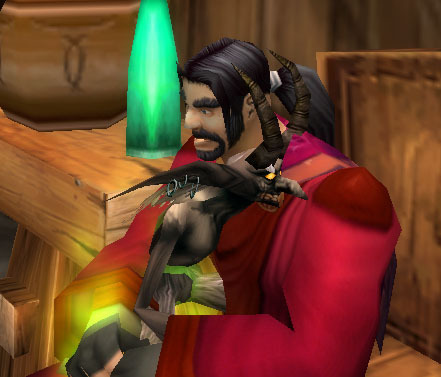 It shows my first ever real alt, Wilson the warlock, sitting in an inn, possibly even in Goldshire, and I thought that it looked cute how he appeared to be hugging the imp that had jumped on his lap. On the reverse end of the alphabetical sort, the sixth screenshot is one of our Zul'Aman group preparing for a bear run by transforming into ninjas. The German titles are a reminder of how I used to play with the German client until Wrath of the Lich King, when I got tired of people being either confused or in stitches every time I linked an item in chat. 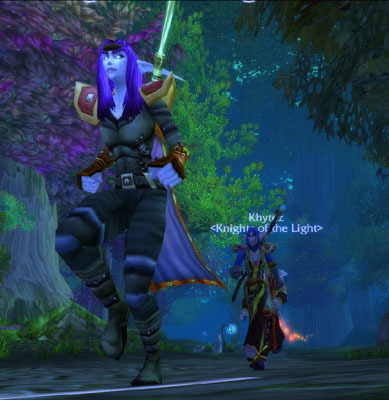 Sorting by date, the sixth oldest screenshot that comes up is one of my night elf priest jogging through Ashenvale with two friends. I remember this zone being the one where I was first introduced to the term "World of Walkcraft" - keeping in mind that this was back when you couldn't get your first mount until level forty, and Astranaar offered the only Alliance flight path in all of Ashenvale. I remember how scared we used to get every time we had to run past Splintertree, because we had a knack for accidentally aggroing one of the wandering guards and getting ourselves killed. Nonetheless, those were good times. You just made sure to turn on autorun, chatted a bit... and panned the camera around to take screenshots of your characters running. The sixth most recent screenshot I took is one of a bit of guild chat in which my guild leader, in his own special way, expressed that he misses having me around in raids (or at least that's how I interpreted it). Finally, let's sort by size - something I pretty much never do, but I want to have a reason to post six screenshots! The sixth biggest WoW screenshot I have is apparently this picture of my Worgen death knight at Light's Hope Chapel. 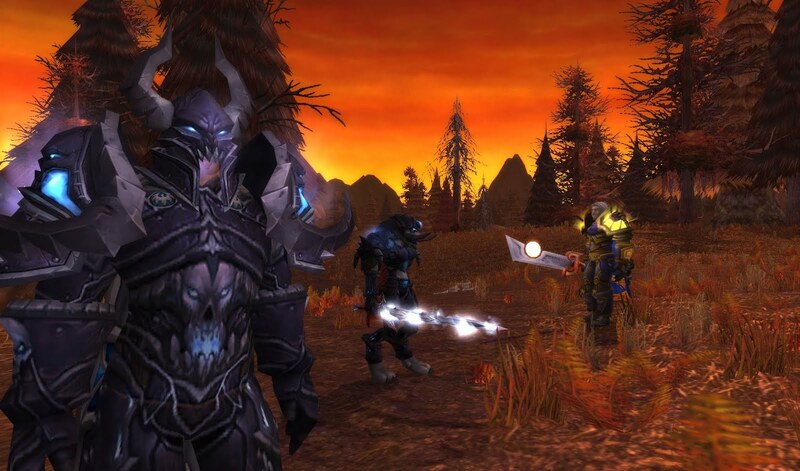 I just thought that the scenery looked cool, and I didn't think of taking any pictures on my first death knight. Unsurprisingly, the sixth smallest screenshot... is one of the old thumbnails I use to link to my characters' armoury profiles on the sidebar. Heh. Thanks for this opportunity to share a few random memories! I won't tag anyone, but if you're reading this and would like an excuse to post some old screenshots with commentary, this is obviously your chance. I'm horrible with my screenshots, I leave them in the default Screenshot folder in my WoW install. I don't resize or rename. (Ones I use on the website I copy and put in a temporary folder.) My one concession is to sort them by year, but that's it. I never thought to sort them, so they're all just a big mess. Reading some of the entries some people just seem to organised with their screenshots! I'm obviously a screenshot slob..
big lol @ "World of Walkcraft"!